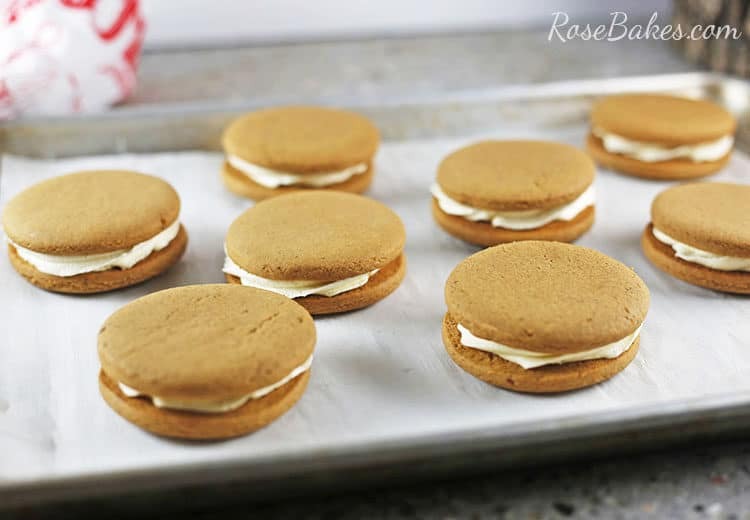 Gingerbread Sandwich Cookies with Eggnog Frosting – soft gingerbread cookies sandwiched around the best and lightest eggnog frosting you will ever taste. These cookies are a special treat – perfect for gift-giving this holiday season. 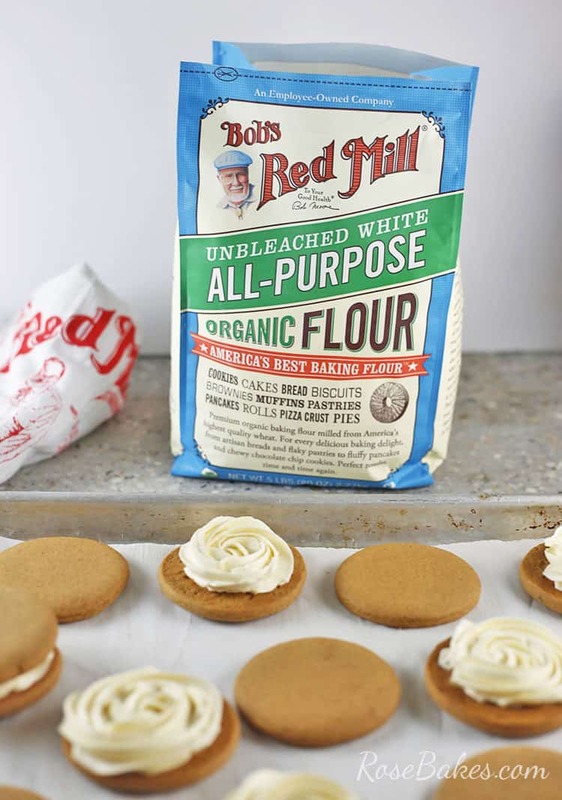 Sponsored by Bob’s Red Mill as part of their Made with Love, Baked with Bob’s campaign. While cakes are obviously my first love, this time of year I find myself baking more cookies than anything else. And if I were confessing my deepest secrets – I like cookies better than cake. Shhhh! I mean, I love to decorate cakes… but if I’m craving sweets, it’s almost always cookies! I also love to give cookies this time of year. There’s nothing better than surprising my Mama or sister with a batch of their favorite sugar cookies. Or my sisters-in-law with their favorite chocolate chip cookies. Baking for those close to you is one of the best ways to show them how much you love them. Or even if you’re baking for someone you don’t know all that well… the gift of something thoughtful and homemade can make the biggest difference in the life of someone lonely or hurting. And if doing it for someone else is not enough – do it for you. I know we all know this, but psychologists have found that baking for others promotes a sense of wellbeing and benefits the baker as much as, if not more, than the recipient. Having a bad day and need a “pick me up”? Bake something sweet for someone else and you’ll feel better! Research says so! This is one of the reasons I was so excited to work with Bob’s Red Mill. They also believe that we can all make the world a better place with small acts of kindness. A better place for the giver and the receiver. That’s a message we all need! Bob’s products are of the highest quality and they will really make your baked goods shine this holiday season. Be sure to print this coupon for $1 off Bob’s Red Mill products before you go shopping! 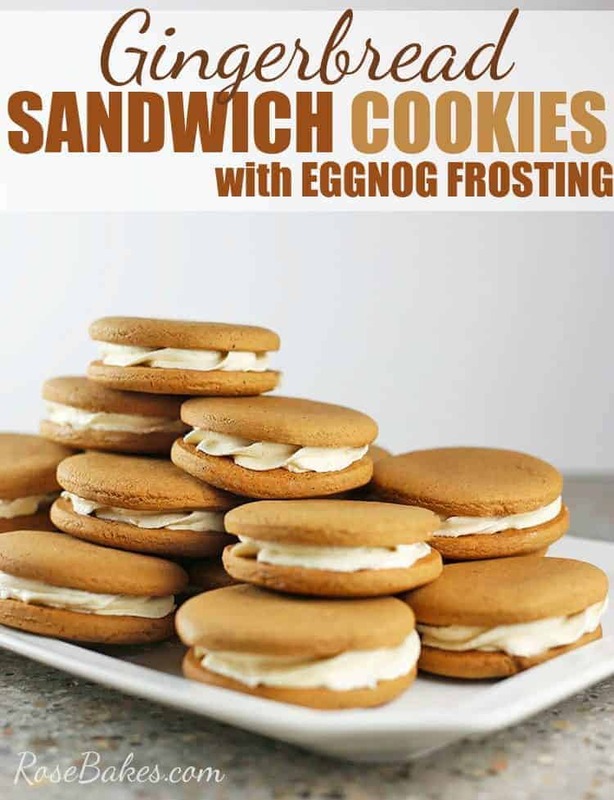 Let me tell you about these Gingerbread Sandwich Cookies with Eggnog Frosting. If you give them as a gift – I promise that you’ll be asked to make them again. 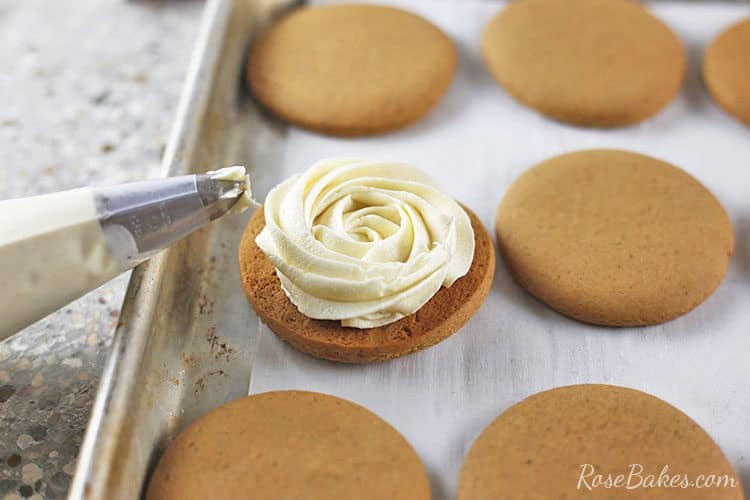 I’m sharing my recipe below and if you love gingerbread, please give this recipe a try and be sure to share (if you have any left after tasting them)! 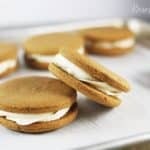 Gingerbread Sandwich Cookies with Eggnog Frosting – soft gingerbread cookies sandwiched around the best and lightest eggnog frosting you will ever taste. In a small saucepan, cream together the butter and sugar. When smooth, add the molasses, cinnamon, nutmeg, cloves and ginger. Mix together, then bring to a boil stirring constantly. Remove from heat and allow it to completely cool. When cool, mix in the eggs and vinegar. Lastly, add the flour and baking soda to the molasses mixture and stir until a soft dough forms. 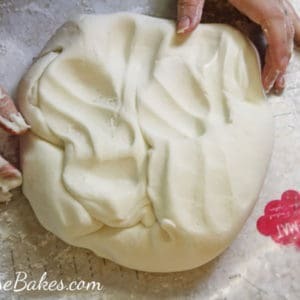 Line a cookie sheet with parchment paper, then pat out the dough into a thin layer. Chill for at least 20 minutes. Cut out cookies and bake on prepared cookie sheet (I use parchment paper or silicone baking mats). Bake for 8-10 minutes. Move the cookies to a cooling rack. While the cookies are cooling – make the frosting. In a small saucepan, whisk together the flour and eggnog, stirring contstantly. It will get very thick, very quickly. As soon as it’s thick like batter, remove from heat and allow it to cool. This mixture will be sort of chunky – that’s okay! It must be completely cool before you use it. As it cools, in a mixing bowl, cream together the butter and sugar until it’s light and fluffy and no longer grainy. Then add the cooled eggnog/flour mixture and the vanilla. Continue mixing for several minutes until it’s very light – like whipped cream. This may take awhile – if it looks separated, keep mixing! Assemble the cookies by flipping one upside down, piping or spooning on a dollap of buttercream, then top with another cookie. Chill for at least an hour – enjoy! 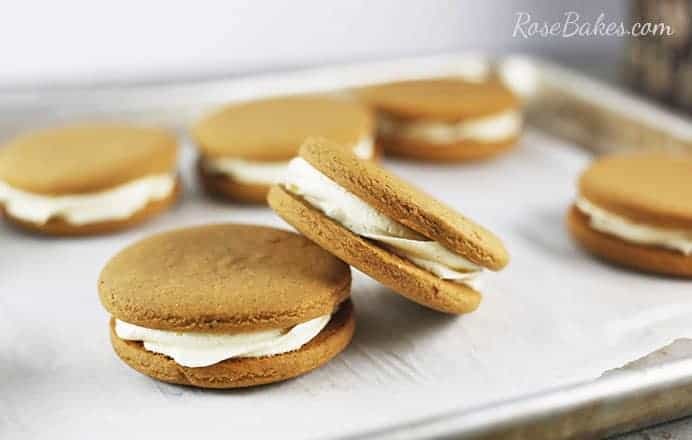 This recipe makes about 20 sandwich cookies total. 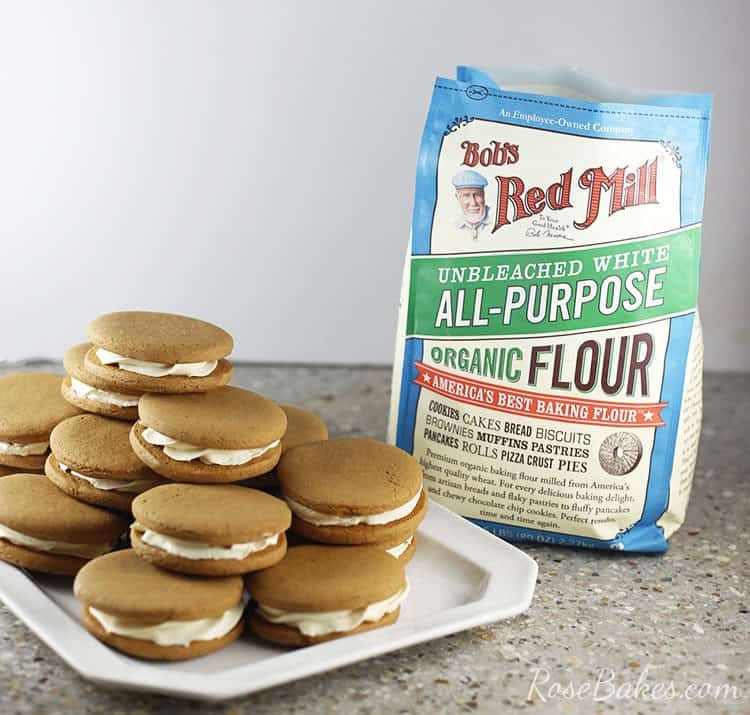 Sponsored by Bob’s Red Mill as part of their Made with Love, Baked with Bob’s campaign. I can hardly wait to try the recipe. And on another note, congratulations on the house. Forty acres! Just what I like–elbow room. Enjoy it! Thanks so much Beverly!! I cannot wait to get all moved in and living there 🙂 Merry Christmas! 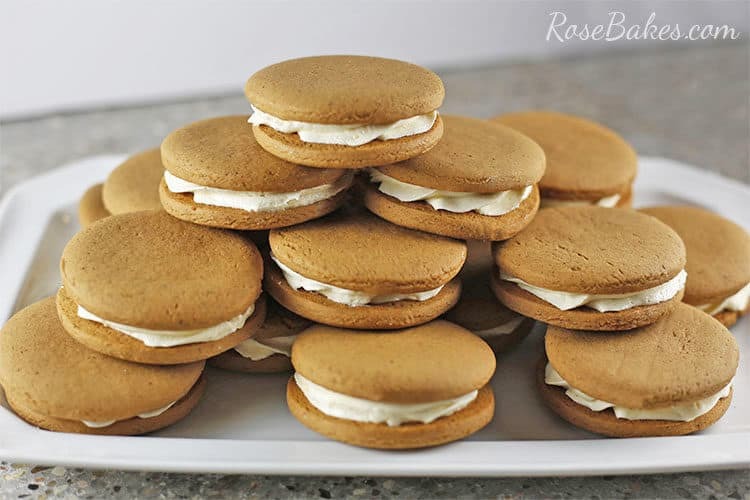 Hi Rose, Your cookies look really good and I do love the idea of egg nog flavored buttercream. I have a comment and question. Question first. Five cups of flour seems like an awful lot for a recipe that only makes 22 cookies. I understand they are sandwich cookies, but still, that amount seems off to me. so I wanted to double check on that. Are your cookies extra large? I would also like to know if the flour/eggnog concoction would work with a different buttercream. I have been using Lauren Kitchens recipe with great success and I like that it’s closer to Swiss meringue than American buttercream in texture. Have you tried it? (and it’s not overly sweet like American) Your method seems like a good way to make buttercream more stable and since I live in a very warm climate, it’s important that I use a stable bc. Hi Ginny. Yes, I’m 99% sure the flour amount is correct but I cannot be sure for a week or two. We are moving to a new home and I have my notes written in a book that is currently boxed up! Oops! 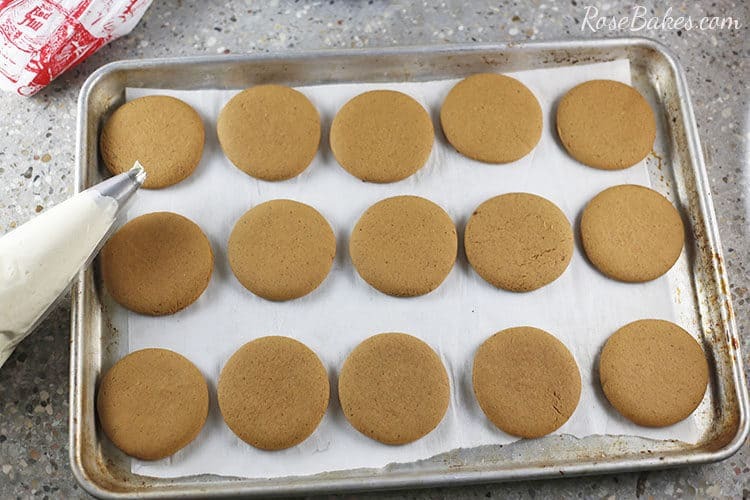 The cookies I made were cut with a 3″ round cookie cutter, and I ended up with 40 cookies (2 per sandwich cookie). I have ZERO experience with Swiss meringue type buttercreams so I cannot give you any advice one way or the other on that. But I live in Southern Mississippi so I know all about needing stable buttercream! Is the sugar in the frosting powdered sugar? Also the directions mention nutmeg but it’s not mentioned in the ingredients. How much? Thanks! No, it’s granulated sugar. And sorry about the nutmeg omission – it’s 1/2 tsp. Merry Christmas!